If I didn’t know any better I’d think this Universal Studios Production was a lost script destined to be on the lower half of a double bill with The Monolith Monsters back in 1957 from director Jack Arnold when the studio was cranking out some fondly remembered sci-fi features. 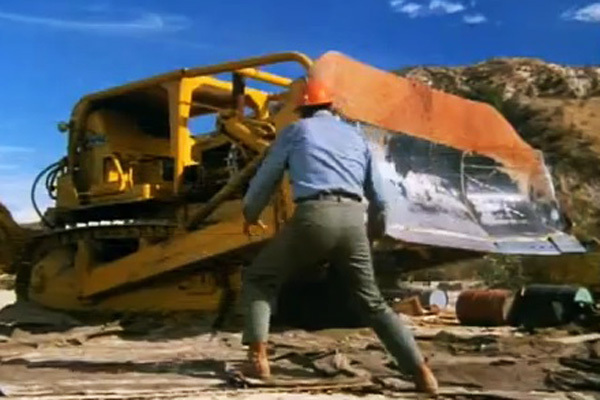 Starring none other than John Agar as the head man of a construction crew on an isolated island battling a runaway bulldozer that has an evil energy controlling it bringing death and destruction to the crewmen after coming to rest against a giant meteorite from outer space. 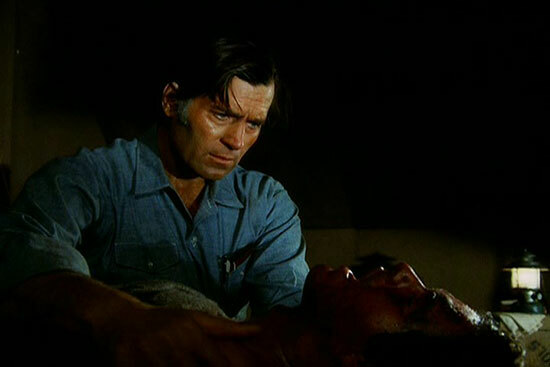 Here we are seventeen years later with a made for television thriller that features he-man Clint Walker as the head man of a construction crew on an isolated island battling a runaway bulldozer that has an evil energy controlling it bringing death and destruction to the crewmen after coming to rest against a giant meteorite from outer space. The gang of six men look to be demolishing an abandoned WW2 base on an isolated isle off the coast of Africa. Classic film fans take note when going through an old locker on the base, James Wainwright finds a pin up of Veronica Lake and is quite excited about it while youngster Robert Urich isn’t quite so enamored of the photo not having any idea who the 1940’s starlet is. For the record the photo is never actually turned towards the screen. At a short 74 minutes it’s time to get that Killdozer moving. When the front blade of the bulldozer comes into contact with the giant rock half buried on the shoreline it releases a large energy that burns one of our workers to death and when Walker looks over the giant machine, it seems to take on a life of it’s own prompting him to disable it. After narrowly surviving the ordeal Walker will tow it in to camp where mechanic Neville Brand will see if he can get it up and running. 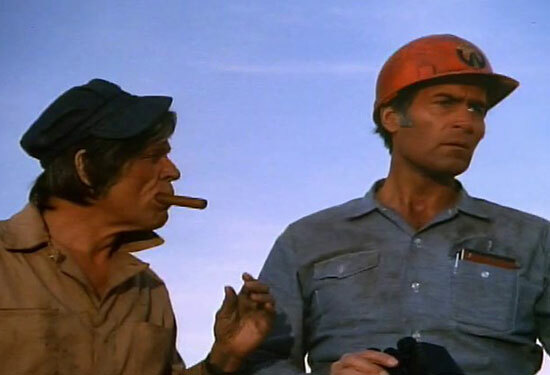 Clint isn’t letting on that something’s amiss with the giant sized sandbox toy but when James Watson Jr. jumps into the driver seat after Brand gets things operating again the bodies will start to pile up. Watson turns the key and that’s all the foreign entity controlling it needs. It’s off and running killing Watson and destroying the crew’s camp. We’ve got four men heading to higher ground but this machine is relentless and even displays an intelligence when Walker plans a sneak attack to once again disable it. The sixth crewman is played by Carl Betz who like Walker and Brand has a career that dates back to the 1950’s. Combined the four remaining men will come up short on several attacks to put the big machine out of order and with their numbers dwindling it looks like it’s going to be up to crew chief and former Dirty Dozen member Clint Walker to step up to the challenge. Nuff said. 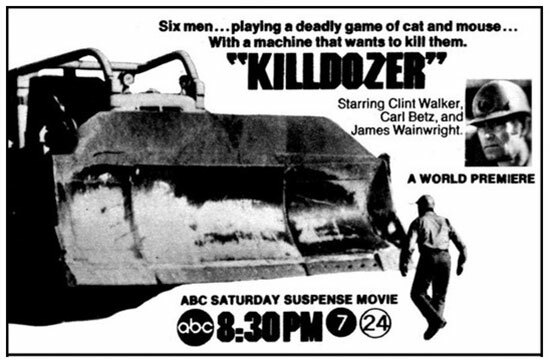 Killdozer represents a title I haven’t seen since I was a little tyke on TV. I won’t swear to it but it is conceivable that I saw it on it’s network premier. The film was directed by Jerry London who has an enormous amount of TV credits to his name ranging from gigs on Hogan’s Heroes to the Brady Bunch to The Rockford Files and beyond. It would appear as if he was best suited to the small screen and that theatrical films were not his forte as noted by his helming the film Rent-a-Cop. Robert Urich was coming off appearing in the Dirty Harry sequel Magnum Force in ’73 and like the director would spend the majority of his career in television with much success. Clint Walker was perhaps best known for his western persona Cheyenne and generally stayed to the small screen but did star in a number of feature films in the 60’s. Brand was one of the screen’s better nasties over the course of his movie making career but like Jack Elam could step out of character and play things a bit lighter and while he isn’t playing funny here, he’s a far cry from playing a heavy. Though this didn’t make it to the screen in the fifties one can still grab a copy of The Monolith Monsters and make it a double feature by also securing a copy of Killdozer on DVD through the made on demand branch of the Universal Vault Series. If only more of these TV thrillers were easier to come by as the decade offered countless terrors and sci-fi efforts made for the small screen. Ah, I was wondering when you’d get to this TV classic (yeah, I saw it as a kid a few times – thanks for the heads up on the DVD release!). 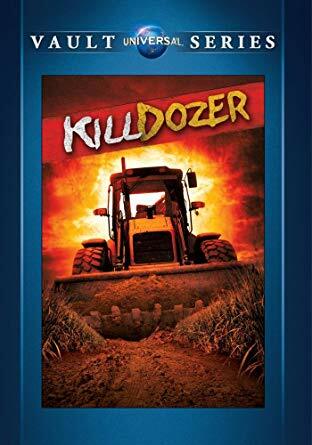 There’s a comic book adaptation as well: https://blogintomystery.com/2011/11/17/its-a-killer-its-a-bulldozer-its-killdozer-worlds-unknown-6/ Not sure what it costs today, but it’s fun to see how it deviated from the TV version. So, you’ve seen it and I know Todd has seen it… nit we gotta check in with the Wolfman and see if he’s seen it out there across the pond. Didn’t know about that comic book so I’ve made the change and added it in. Good call. I recall Todd featured it and knew you had to have witnessed the carnage so yes we’ll have to see if that Wolf guy can say the same. Love those 70’s TV terrors. So many awaiting to be rediscovered that are so hard to locate. Have fun for a fast 74 minutes. Very typical of the thrillers that found their way to TV in the 70’s. Plenty of nostalgic memories for plenty of us. An inspired,if oddball choice,the best thing I can say about the film is that Clint looks great in this one. would make a wonderful double bill. Plenty of those actors turned to tv at that time. Walker had some decent 60’s efforts but no major hit I can recall. Yes this one seems out of the fifties.